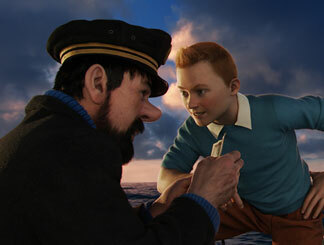 Steven Spielberg’s THE ADVENTURES OF TINTIN is a glorious, grand animated adventure the whole family can enjoy. Tintin is a young curious reporter who buys a model of the lost treasure ship called the “Unicorn.” A sinister man approaches Tintin, offering him an enormous sum for the ship. Tintin refuses, valuing the ship for its beauty, not its commercial value. Eventually, Tintin discovers that there are three model ships, all containing a hidden clue to the lost treasure. He and his dog, Snowy, team up with the drunken descendent of the Unicorn’s captain to retrieve the treasure. To find it, they have to contend with the descendent of the pirate who tried to steal the Unicorn’s treasure before it was lost at sea.